The mini6410 Single Board Computer is a high-performance controller board introduced by CoreWind. It is designed based on the S3C6410 microcontroller, 256MByte mDDR SDRAM, 256MByte Nand Flash, RTC, Audio and net on board. .
minidevs.com is designed to highlight open source softwareare communities and projects that utilize Samsung technology. It aims to centralize information about open source projects on Samsung S3C6410, S3C2449 devices, We encourage your suggestions on the site and ways for Samsung to interact and serve the open source community. It is a open source project that came from CoreWind Corporation. This page will explain how to Compile the Android system. 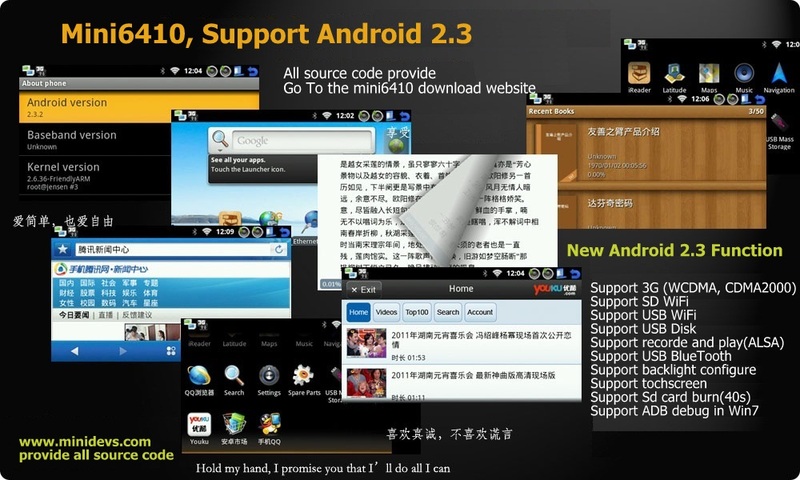 If you buy Mini6410, the Android source code and cross compile tools is supplied in DVD. This page was last edited on 4 November 2014, at 03:25.